Let me open this blog with a little housekeeping chore. Because I’ve retired from being a hospital president (Yes, they replaced me with two great people, count ‘em, two.) , I’d like to change the name of this thing. It’s not that I’ve established a P-Diddy-type Twitter following where 100,000 human beings are waiting with baited breath to see what my next move will be, it just doesn’t seem right to keep calling myself a hospital president. We know who reads this thing, and we are grateful to our loyal, talented, and brilliant followers. We also know that we can link the old blog names to get you here. So, regardless of what you typed, or what gets Googled, our genius social media maven & webmaster, Michael Russell, can help to bring you home to this site. Okay, so as a transformational advisor, a broker of sorts, most people with whom we have consulted have described me as a person who can fix things that are broken before they actually break. Maybe we should call it the “Break it if it’s not already fixed” blog. I’d love it if it was a name that would generate millions of hits and companies would fight to advertise on it. My first thought was to use nickjacobs in the title because there is a Nick Jacobs on Facebook who teaches Aboriginal people in Australia, and he seems popular. There is another Nick Jacobs who is a professional organist, and one who is an athlete. There’s a Nick Jacobs who is a consultant and another a paramedic in London, one who had a blog who is a yachtsman, there’s my son, the commercial real estate broker, and finally, there’s a Nick Jacobs who does pornographic movies who is not my son. Actually, that Nick Jacobs’ followers would probably be the most disappointed by this blog. Since the .com version of nick jacobs was already taken by some guy in England, we captured nickjacobs.org, and that will work for right now. If you have any ideas, however, that you think would really rock the blogspere, let us know and we’ll check with our domain registrar to see if it is available. In fact, if you are the winner of a Name Nick’s Blog Contest, I’d be happy to consult for free BY PHONE for at least one hour of brainstorming with you about the topic of your choice: music, healthcare, proteomics, teaching, PR/Marketing, the travel business, or even physician recruitment. Remember, Hospital Impact is already taken, and, because my last three consulting jobs have been with a newspaper, a nonprofit arts oragnization, and a chain of hotels, we don’t want to think too restrictively. Gotta earn a little money, too. When we ran the breast center, we found that the website got more hits than anyone could imagine. The problem was that the readers were mostly thirteen-year-old boys who probably weren’t too interested in running a hospital. After Miss America had visited us, the hits went up exponentially when those two searches were combined. Somehow, I don’t think that Nick Jacobs’ Breast Center for Miss America would probably get me the type of following I’m currently hoping to attract. On the other hand? 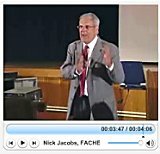 While teaching junior high school instrumental music in the early 1970’s, Nick Jacobs made an extraordinary discovery. He learned that, by empowering his students and surrounding them with positive influences, he no longer was providing a service or even an experience for them. What this entirely unique teaching style resulted in was a method for helping to transform students. By providing with both passion and commitment the tools needed by them to undertake their journey, his involvement with the students became a means of dramatically helping them to make whatever positive life changes they were seeking. It was during that early period in his career that he also discovered that this formula could work to positively change lives in almost any aspect of living as he ran an arts organization, a convention bureau, and finally a hospital and research institute. Since that time he has dedicated his personal work to helping others make their lives better, and that is exactly what he is doing in his position as an international executive consultant with SunStone Consulting, LLC. Maybe that will give you something to chew on? Okay, something on which to chew. SunStone Consulting. With more than 20 years experience in executive hospital leadership, Nick has an acknowledged reputation for innovation and patient-centered care approaches to health and healing.